When i'm a guest on a multiplayer game i can't enter my own or other guests lodges in the game, if i try i get an never ending black screen. I don't get this if i try to enter the hosts lodge though. This bug has been around almost since the time the lodges got released, but i can see nobody has made a bug report yet so i will do. I have many other people getting this in my MP games. Just join any MP game and enter your own lodge or another guest in the game. 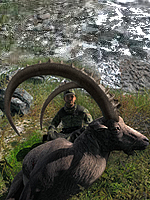 What kevin2106 could try is remove all the animals from that specific lodge using "game management" (launcher) and then try again. If he can access the lodge again, then it might be an issue with one of the animals. If that's the case, then by adding them one for one he should be able to track down which one is causing the issue. Read the report levado. The problem is not only my lodge, it's all other people in the server as well. I can only access the hosts lodge, if i try to go into mine or another player in the game i get a black screen.